“Useful is beautiful”, as William Morris said. Well, that makes the Vein Tap 2 twice as beautiful as most other tap tempo pedals. Reason being? Simply, you can control two pedals with just one tap. Earn up to 100 Vein Tap Points. One is good. Two is better. That goes for many things; guitarists in a band (unless you’re Brian May, of course), guitars in your rack, amps on your stage (one for dirty, one for clean, that’s the way it would be if only we were all rich and had strong roadies). It also goes for outputs on your Vein Tap tempo pedal. Perhaps you’d like to have your phaser and delay match tempo perfectly. Perhaps you’re lucky enough to have two delays, setting one to a dotted eighth and one to a quarter note (this, by the way, sounds absolutely amazing). Either way, the Vein Tap II is the way to get it done. 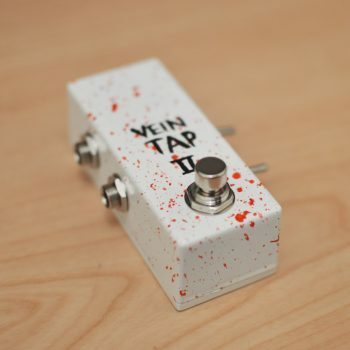 The Vein Tap 2 is compatible with all pedals which can make use of a tap tempo pedal thanks to its polarity switch options. If you’re unsure what a polarity switch is for or how it can benefit you, you might find it handy to read our Polarity Switch article, which will explain everything you need to know. You might not need one, in which case the option is there to have no polarity switch at all. Perhaps you only have pedals which need a Normally Closed tap tempo, or Normally Open – you can choose how you want your Vein Tap 2 wired and leave polarity switches out of the game entirely. Perhaps you’d like a little cross-compatibility, but will only use your Vein Tap 2 with one kind of effects pedal: in that case, just one polarity switch is for you. To ensure ultimate compatibility, and to futureproof their pedalboard in anticipation of your next great pedal discovery, some people choose to have two polarity switches, one for each output. It’s entirely up to you! 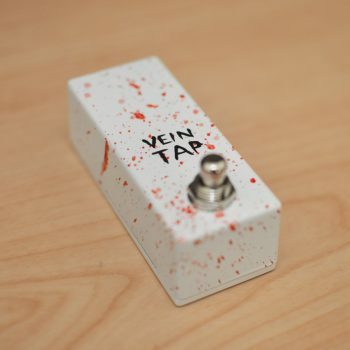 Buy a Vein Tap 2 now! Make your pedalboard that much cooler. It makes more sense than bringing meat to a BBQ! This is my second Vein-Tap purchase, and once again I couldn’t be happier. Controls my RC-300 and Memory Tap Tempo as advertised. Utterly delicious. Great quality little pedal that works a treat. Doesn’t take up much room, is very light & looks cool! Using it to control tap on a Timeline & Mobius. Great quality build, doesn’t take up much pedal board space, looks cool as all heckity and a really useful pedal! I use it to control two delays, with one set to dotted 8ths and one set to slower delays. Makes it all sound a bit fluttery and cool. This is a great tap tempo. I love the feel of the pedal on the taps. It’s smooth and responsive. It’s a very sturdy pedal with great quality to its build. compact size and very cool look. With my order I asked them to ad my bands name to the pedal. And I now have the dopest tap tempo ever! Thank you Vein-Tap!